I have found it! The ultimate solution to my office politics problem! It's a rooster!!! 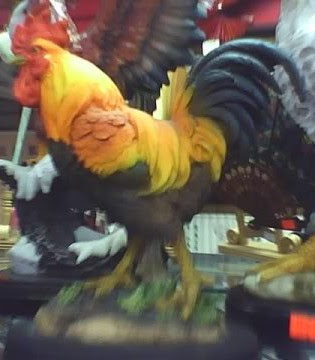 Any rooster, it seems will do, even! We are not mall shoppers. Growing up, my mall of choice to hang out on the very rare occasion I did such a thing was Fashion Place Mall. My sisters was Valley Fair Mall. Both of these malls are currently undergoing massive makeovers, so I do not guarantee maps and such on the links. But, anyway, while walking through Fashion Place Mall yesterday we happened upon a store called Asian Gifts. We went in, hoping to find a birthday gift for my mom's best friend. Her birthday was also on Sunday and I hope she had a good one, too. 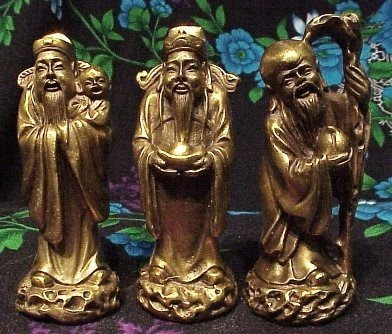 We found a couple of things of interest, but mom decided on a set of 3 Chinese wisemen for Judy's birthday gift. This particular shop does not have its own website. They are to help bring Good Luck, Wealth and Health to your household and are best placed in the dining room. In looking around, this shop was very good about having papers posted explaining the purpose of many thing on display. One especially caught my eye, it was for The Rooster: I laughed and showed my mom and Steve, who just basically rolled his eyes. Many of you know my background with "jobs" and will immediately get the reason for our reactions! I don't know that I will be in a position to test this purpose, but I found it amusing, at least! Office politics are not my friend...oh the books I could write! My many experiences also lead to my fascination with the only reality show that I really like and watch faithfully, The Apprentice! So, what are your experiences and solutions to office politics where you work or have worked?! I try very hard to stay far away from office politics, but sometimes you just can't run far enough or fast enough. So, let me know if the "rooster" works. I'll be sure to buy several to send to some people. That is pretty funny! I'll try to remember that for your next birthday! Thanks for buying my family lunch for my birthday! We loved the Sweets coupons! You are awesome! I just found your blog and decided to take a peek. I hope you don't mind. Where have you been? You went from blogging everyday to once a month?? I miss your posts!